We’ve found paradise (well, except for the lack of dancing girls Dan’s been hoping for). We’ve spent the last two weeks toodling around several islands that are near Loreto. We’ve had some wonderful sails along the way, and only motored a little bit. This is exactly what we have been seeking! 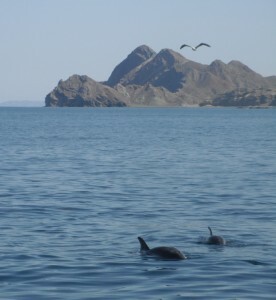 The first stop we made was to a small island just a few miles north of Loreto, called Isla Coronados. It’s a 950′ volcano, with steep cliffs on one side and white sandy beaches alternating with shallow rocky reefs on the other. There’s a long sandy spit running west, and you can anchor either north or south of this. Because the winds tend to come from the south this time of year, we chose to anchor on the north side – along with 6 other boats that had arrived before us! We spent 4 days here, swimming, exploring the beaches, and of course, doing boat-work. Other boats came and went; because it’s so close to Loreto, there are day-trips for tourists, although in the summer the tourists tend to be locals. The water was spectacularly turquoise, forgive me if I say that every time I write! There were schools of fish jumping in a way that reminded Kathy of a line of ballerinas in toe-shoes, but perhaps you just had to be there. 🙂 We also saw several turtles over the course of the day, but they didn’t ever stay for long, just up for a breath and back to wherever the turtles go when in paradise. There were quite a few leaping rays, throughout the day, and most concentrated in the mornings. They were making multiple jumps in a row, and seemed to being doing it in small groups. The third morning we were there, we were treated to an amazing “ray show” (to quote a woman that we talked with later that day). There were hundreds of rays jumping all around the bay, each landing making a splash which began to sound like applause. Most of them were landing flat on their bellies, with a loud “splat!” but some were actually doing flips. We haven’t seen that before, although we’ve heard of it. These rays were similar to manta rays, with two long fins on either side of the mouth for funneling in plankton-rich water. They were a good bit smaller than mantas, though, and are apparently called mobula rays. It seemed obvious to us that this was a mass courtship event, and we speculated that the jumpers were the males and that they were trying to make the loudest sound, typically by jumping the highest. A number of times after a string of jumps, there was an additional behavior at the surface that we were convinced was mating: we could see the very tips of the wings above the water’s surface, usually two pairs, swirling around and splashing for 30 seconds or so and then going back underneath for a cigarette. We did a little research on-line, and found that there are numerous theories about why they might be doing this, ranging from parasite removal, a cooperative feeding technique, or just in play. It was a real surprise to us that mating was not mentioned as a possibility! Perhaps there are multiple behaviors that look similar but have different purposes… At any rate, the “show” was a truly amazing sight to see. It was not repeated the next day, and we haven’t seen anything like it since. The last day we were there, we hiked to the volcano’s summit with a couple from another boat that was anchored near us (Jaye & Irwin on Winsome). We thought we started at the trail-head, but it petered out pretty quickly and soon we were scrambling over huge boulders from a lava flow. It was very slow going and getting hot, and we hadn’t even begun gaining any altitude! So we decided to change course, and we wound over to a flatter sandy area that came closer to the base of the mountain. This was a good move, because we happened to find the real trail, which we could tell because it was outlined on both sides with a perfect row of cabbage-sized rocks! Our friend Irwin said that we’d found the yellow brick road! Once the trail came back to the lava rock, it was marked with cairns, although they were fewer near the top and we got off trail again before summiting. We spent a bit of time at the top enjoying the 360 degree view of the Sea of Cortez, the Baja peninsula, and a few neighboring islands. It was worth the work, but it was mid-day and getting hotter, so we headed back down. The trail was much easier to pick out, but we ran out of water and came close to heat exhaustion. As soon as we made it to shore, each of us waded right out into the water to cool off – delicious! Then we hopped in the dinghy and came back to Lungta for some serious rehydration. Our friends were heading south, and we decided to travel together for a few days. First we popped back to Loreto to visit the Sunday Farmer’s Market and get some fresh fruits and veggies. While there, we met up with two other boating couples and stopped at a restaurant for brunch together. Then we sailed across the channel to Isla Carmen, a large island with a dozen or so anchorages all around it. We spent the next week or so circumnavigating Carmen. First we sailed to the closest anchorage, named Puerto Ballandra. We had a beautiful sail, including a drive-by visit by a huge pod of leaping dolphins. Late in the afternoon, just as our friends were dropping their anchor, they called us on the radio and said that there were tons of bees all around and they’d prefer to go somewhere else. Some people in the local boating community like to call this place Bee-landra, but this isn’t unique to this spot. Apparently there is a type of honey bee in the Sea of Cortez that spends lots of its time in search of fresh water. The scouts travel far and wide in search, and when they find some (like in a boat’s shower) they bring back a whole swarm of their friends and family. Although we’ve seen a few bees here and there, we have yet to see a swarm. They don’t seem to be aggressive at all, but nonetheless they can be pretty annoying. They come inside and buzz around, they land on your sweaty back or legs, and you need to watch out that you don’t step or sit on one as you move around your regular life. A woman we talked with more recently told us that these are called Mexican Sweat Bees. So we decided to head to a place on the northern point where none of us had been before, Puerto de la Lancha. This was another amazing stop! We both sailed right in on 15 knot winds and easily found a spot to anchor. 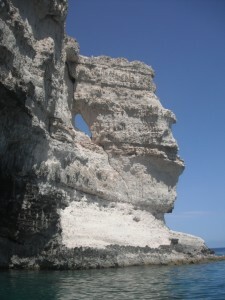 There were cliffs all around, broken up with cuts and shallow caves and even an arch or two. The island is made up of the wonderful colored layers that we’ve raved about before, reds and greens, whites and browns, greys and yellows. This anchorage had bits of all of them, including some really cool “lacy” rock formations with lots of holes and interesting shapes. Underneath the surface was the best snorkeling we’ve seen yet, both in quantity and variety. There were lots of sections with boulders piled up, and other sections with craggy walls. Kathy spotted an octopus and Dan a turtle. One day we took another hike, but were cut a bit shorter than we’d planned. This island was once home to a big salt operation, and there’s a trail to the salt pond a couple of miles away. We left the dinghy at a spot that had been used as a boat ramp, which had a road leading from it into the interior of the island. This bay had been used to bring workers in from Loreto. The beginning of our path wound up and around some sandy dunes and rocky hillocks with a few deep arroyos cutting through. 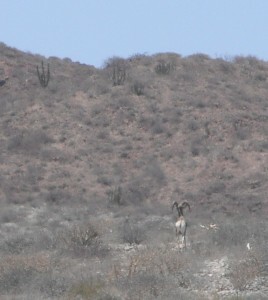 At one overlook, Dan spotted a bighorn sheep, which spooked when he called to the rest of us. We all watched it bound across a high plateau. A couple miles further down the road we encountered a jeep with two men in it who told us that we needed to turn back, that we couldn’t go any further. Apparently the land where the salt operation had been was sold recently, and the new owners didn’t want visitors. The bighorn sheep had been brought to the island a number of years ago, and the jeep had the insignia of a hunting outfit on its door. A few days later, as we were sailing on the western coast of the island, both Dan and I heard a loud crack that we thought sounded like a gunshot. Our last night in this anchorage, Dan and Irwin caught three (yummy!) fish from the dinghy and Jaye showed Kathy how to make Pad Thai without *too* many exotic ingredients – we had a feast! 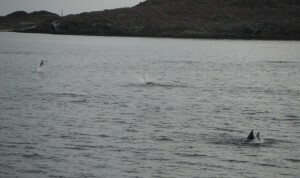 There were a few dolphins swimming around the bay with us this evening, and at various times they were doing some exciting acrobatics. Kathy thought they were pretending they were whales. At least one of them was doing repeated tail-slaps on the surface of the water, 4-6 times in a row. We’ve never seen this from dolphins before, but we did see a few whales in Alaska do this. It appeared that another one started imitating him before the evening was out. There were also a few instances of spy-hopping, where they peek their heads up above the surface and then back down, another unusual behavior for dolphins. They stayed within sight of the boat for more than an hour. Then we went our separate ways: Winsome headed south towards La Paz and we headed east the other direction around Isla Carmen. We had a typical day sailing, which these days means that we start out with a bang, have an hour or two of splendid wind, then sit in the doldrums for another couple of hours until the wind picks up again in the late afternoon. We changed our anchorage plans several times over the course of the day, and ended up in a place on the northeast side of the island called Painted Cliffs. Not surprisingly, this place has lots of interesting rock walls with all the colors and craggy formations that we love to poke around. The terrain underwater was also quite rocky and made our dinghy exploration more challenging. 🙂 We love to poke along the shoreline in the dinghy looking at the more interesting features up close. We’re expecting guests, Dan’s father and then youngest son with his girl friend, in a few weeks, and we’re scouting out places to take them. So we’re visiting lots of different places in the Loreto area to get the lay of the land, but no longer staying anywhere for long. We continued around the island, and stopped at two more along the way (Isla Monserrate and Isla Danzante, for the cartographers or geographers out there). Then we decided to make a quick trip to Loreto to catch the Sunday Farmer’s Market again. We stayed the night just off the shore there, although it’s an open roadstead anchorage. That night there was a lot of storm activity which blew over from the mainland. We watched lightning off in the distance, but were convinced that it had died off before we went to sleep. We made sure things were secure on deck just in case. At 5am – boom, boom – a big crack of thunder woke us from our sleep. We jumped out of bed and saw that a storm was pretty close, with lots of lightning and thunder. We were in quite shallow water and unsure if this storm was going to include much wind, so we pulled up our anchor and moved out into deeper water. Of course since we were in a hurry, nothing went as smoothly as usual. The anchor chain kept getting stuck in the pockets of the chain-wheel, the engine didn’t start on the first try, etc. But in the big picture, everything went fine. We saw some pretty exciting lightning, some very close with the thunder co-incident with the bolt. We got a little bit of rain, but still not enough to wash the layers of dust off the sails and decks – just enough for a fashionable pattern of overlapping dots. And now we feel more comfortable with some of the more intense weather patterns that happen here; not complacent by any means, but more confident that we know what it will look and feel like, and we know what to do. As we were motoring along, Dan put out a fishing line as he often does, and a dorado bit. These fish are one of the sportfisher’s favorites: they’re tasty, they’re beautiful, and they put up a good fight with a big show of leaping. We didn’t know it was a dorado until it was right up alongside the boat, because it was very passive, but just then it began zigging and zagging, and it managed to shake the hook off. So we got to see this beautiful green and yellow fish swim off into the deeps. A little disappointing, but exciting nonetheless.